RevK®'s rants: Where am I with these damn Stargate playing cards? Where am I with these damn Stargate playing cards? Previous design, see end of this post for latest. This whole project would be at least a month sooner if MGM simply replied to emails even just the same day. Even next day would have been good. It is very frustrating, in some cases waiting a week, or more, for a reply. However, I finally got (on 20th): "I have been receiving your emails however I have not been able to spend time on this at present. If you are willing to pay a $5,000 minimum guarantee (or BPS equivalent) and have liability insurance, we can grant you the license for the cards." So, they can grant a licence. I immediately sent back the completed application and asked how I pay the $5,000. No reply since (that is two of their working days they could have replied). Not even a clue how long it will take. I don't hold out hope for a reply this evening either (they are US time zone, obviously). $5,000 is a lot. It is about 10,000 packs of cards worth of royalties, and is not something they will refund if I don't sell that many. However, I have got to the point where I want to do this anyway. I have created these cards from the C code to make the pips and layout to the drawing of the court cards and put in a lot of my spare time on this. 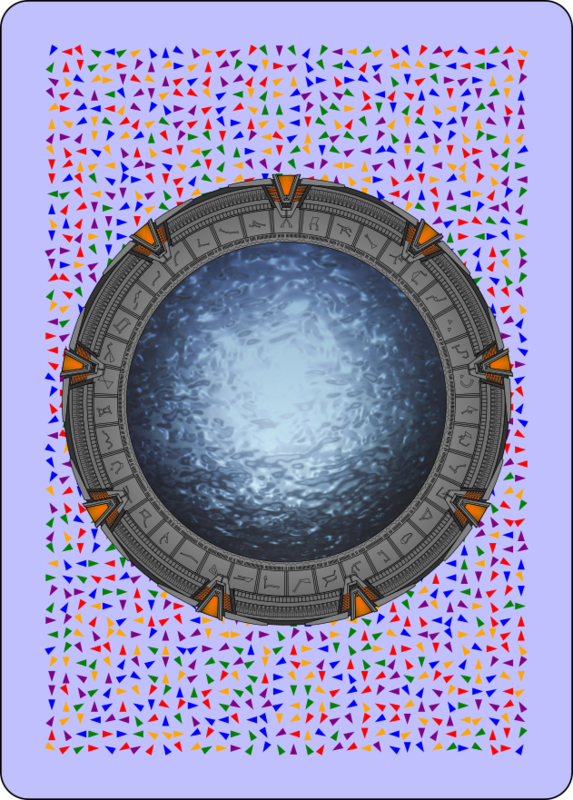 I'm a bit of a Stargate fan, and so if I just break even I'll be happy, and if not, it will be a bit of a folly, but entertaining and educational anyway. It may be a "sunk cost fallacy" but I'd like to see it through now. At the end of the day it is my money - some people have cars - I have MGM licence (soon) and Stargate playing cards! I rarely get to do anything even vaguely artistic (failed Art O-Level), but I hope people like what I have created. The only advantage of the delay is I have spent time verifying things like checking gate addresses (not easy), and that the shape of the Stargate dialling glyphs are correct (also not simple), and fine tuning the layout and exact composition of the packs I have designed, etc. The card designs are all ready. Ivory Graphics are putting together the quote for printing now - and I have decided to "tack on" a couple of other packs to make use of the volume discount. 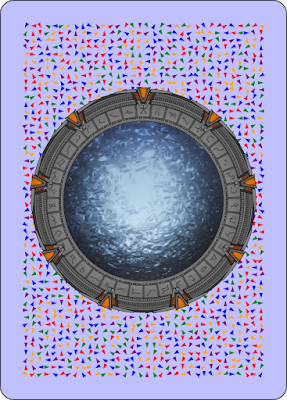 The plan is to make 1,000 Stargate packs initially (500 single packs, and 500 deluxe packs). Maybe not sending all to Amazon at once in case I find other channels by which to sell them. The two extra "fun" packs I am tacking on are a seriously minimalist pack, and a left handed pack. Left handed just means the index is only on the right. The minimalist pack however is even more minimalist than the minim pack, having just an index character and suit in one corner, all white otherwise, white backs, and white box (apart from barcode on base). Both packs should be interesting to list on Amazon and great fun to play with (especially as I am not actually left handed). Found in a corrupted section of the Lantian database was a reference to various common games, including playing cards. Stories of these card games no doubt inspired the early card games on Earth in the 15th Century, but some details we lost in the mists of time. For a start, Alteran playing cards have 64 cards in a deck! We know from the time that Jack O'Neill had the Ancient repository of knowledge downloaded in to his brain that the Ancients did, at some point, use base 8. It should be no surprise that the Alteran playing cards have 64 cards as that is "100" in base 8. Any race with a fondness for powers of two would create games using nice round numbers like 4 and 16 and 64. We also know from Samantha Carter, when reprogramming a Tobin mine, that any advanced civilisation needs to have invented "zero", so it should be no surprise that the cards start from a zero value. Once travel to and from Earth was finally established, the Atlanis Bridge Club were able to get decks of cards made up in the style of those original Alteran playing card decks to play proper Alteran card games. Sadly the database lacked details of the court cards, so we used classic 19th Century designs, but we do know they used Alteran characters and digits in the corners. This was not easy, as personal items are hard to get shipped on the Daedalus, but because of their small size an exception was made. 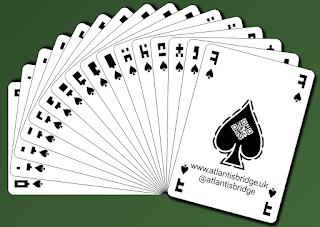 Playing bridge is easy, 16 cards each and allow bids up to 16. What can be more challenging is playing other common games using Alteran playing cards. Learning the Alteran digits and characters should not be hard. 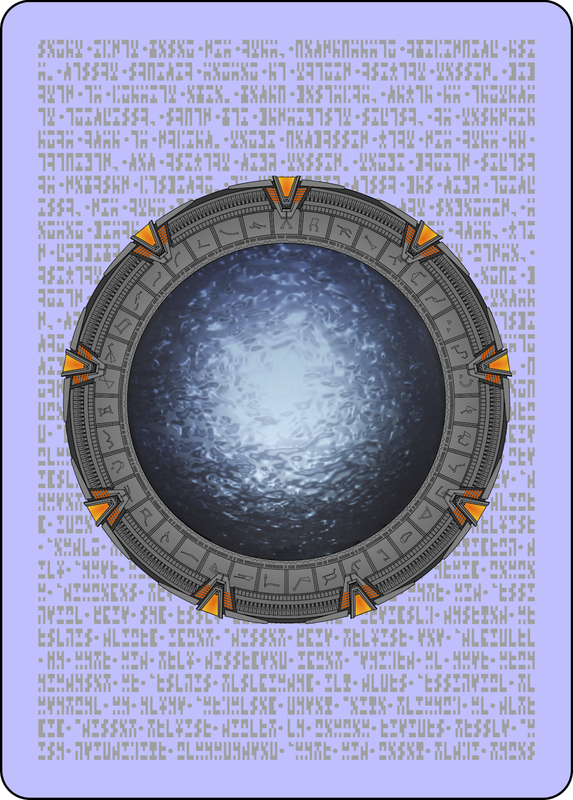 Secondly a deluxe deck which has the same 64 card deck plus a second which has 41 gate symbols, a gate symbol name card, and some gate address cards. Making games for these extra cards is not so simple. Dr Elizabeth Weir realised that the replicators had given away some more detail about Lantian playing cards after she had a nasty run-in with nanites invading her brain. They showed her that there are playing cards with gate symbols on them. Unfortunately it is not clear how they are used in games, yet. I have also created Facebook and Twitter for the "Atlantis Bridge Club" so there is somewhere to discuss the cards and the games. If you want to see the actual card designs, the decks are here. Happy to have comments on the design, whilst I wait for MGM. So, still, I am ready to roll and get cards printed and on Amazon, just waiting yet again for MGM. So, watch this space! I asked that (no reply). I wonder if she means GBP? If you're getting that many printed, I'd invest it making the back of the card look good, the pic above makes it looks little home made and looks a bit naf (sorry!) It gives the wrong impression of the quality and the time (months!) you've put in to this project. Interesting - the gate looks good, I think, so I assume it is the rest that is an issue. Maybe gate on plain colour would look "better"? I agree with Anonymous - they back does look a bit naff. Can I suggest using the gate symbols rather than triangles (which also make me suspicious of it being a marked deck). OK updated back on original post as a P.S. Thanks for the comments - I had not paid as much attention to the back - my first draft was a simple gate drawing on white, looked less naff maybe but a tad minimalist. This version was a nicer gate and a puddle, but on the general arrows back I had designed some time ago. I do think the one on the grey Alteran text looks way better, so I appreciate being poked on this. I'm getting another test pack printed to see it in real life though. I'll post pictures when I have it. Fantastic project, and thank you for posting the information of how this process of getting the license has worked so far. Can I suggest, with regard to your sales channels, that you include something direct for readers of your blog (it will hopefully reduce your fees)? I certainly will be ordering a couple of deluxe packs as my Dad and I are SG fans. One of the problems is that Amazon fulfilment is not far off what we’d end up paying for card charges and postage and a Jiffy bag, maybe even less. I’ll see what I can do though. Have you seen the contract yet? $5K and some fat, barely sensible uncapped indemnities, in all likelihood. They have now sent me to talk to a UK agent! Yeh, not sure what liability could come from paying cards really! And who would ha e liability - the manufacturer or the designer or the seller? They will probably ask for uncapped indemnity for any loss they might suffer no matter how it occurs or who causes it... Don't expect it to make sense. Suggest discuss with lawyer about limits of enforceability, but expect to have to live with uncomfortable uncertainty. They likely won't be reasonable. (if you think BT's attitude to negotiations is bad, rights owners are a whole 'nother level) . Well, we are starting again with a UK agent. If the contract is silly one can always make a new limited liability company for this. But it is odd - my understanding as a seller is liability is pretty much refund/replace if broken. A manufacturer could have liability re any safety aspects of goods but hard to see what could apply to playing cards. And MGM would never have any liability anyway. So just mad. We'll see what happens. someone who got hit by a flying fragment of orphan looks around for someone to sue for emotional distress: the nutter? He's dead. You? You're poor and foreign. MGM? Deep pockets and they just want the problem to go away. Go for it! I can't imagine that even the US legal system is that mental, but you may be right I guess. "We cannot accept liability for accuracy of gate addresses. If you use them and end up on the wrong planet, sorry."